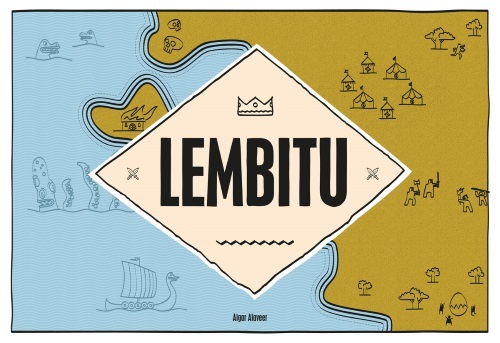 Lembitu* is a co-operative board game from small Estonia publisher 2D6.EE, by designer Aigar Alaveer. It was launched at the UK Games Expo 2015 in Birmingham with very little fanfare, but if you like co-ops it may well be worth your attention. 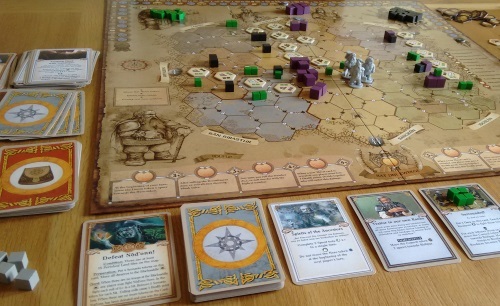 The game plays two-to-four players but like most co-ops it is equally good for solo play. Games shouldn’t take an hour with four and with one/two it’s possible to play in 30 minutes – or, if things go badly wrong, it could be considerably less! The components are a slightly mixed bag – but mostly top notch. The box and board and beautifully illustrated while the 60 cubes (the bad guys), three custom dice and 20 fortification tokens are industry standard. It’s just a shame the cheap plastic turn marker and player pawns look like they’re our of an old budget copy of ludo… But as the game retails at about £25 it still represents solid value. In terms of theme, Lembitu represents a tough time in Estonian history – the Livonian Crusade – when the nation was being conquered on all sides by the Danish, the Crusaders and Novgorod (an ancient part of Russia), with only their Leader, Lembitu, standing in the way of them all. That’ll be you then. In truth, for most of us, the theme is non existent. You can use the three different coloured cubes as you like as each army is essentially the same – one hit, one kill – while your cheap plastic player pawn has all the personality it deserves (ie, none). 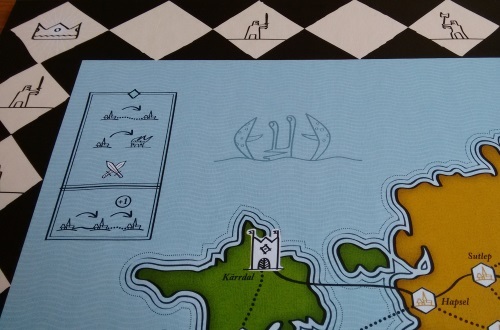 This is an abstract co-operative game, unless you’re being taught it by an Estonian history teacher. As with any co-op that has no hidden information, as long as one player is fully versed with the rules you can teach as you go. Game play itself is straightforward and once you get up to speed things rocket along – but unfortunately the rulebook isn’t the greatest and there is also an error on the board itself: pretty inexcusable, especially as it isn’t mentioned in the rulebook/in the box as an addendum (I’ve highlighted all the problems/answers I had in a Lembitu rules FAQ over at Board Game Geek). Turns are super simple. 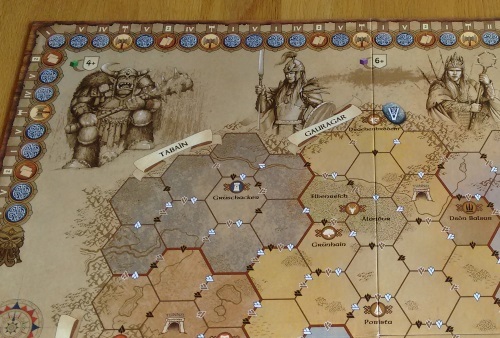 First, move the turn marker to the next space (nice and clear around the edge of the board) – this will indicate if it’s your turn, an enemy turn or a rebellion, or if you’ve won (by getting back to the start of the track). Winning is simply a case of surviving long enough to get once around the board. The bad guys move, Defenders of the Realm or The Dwarves style, from the the edge of the board towards your capital along pre-set paths. If they make it, or you run out of defenders (players), you’ve had it. On each bad guy turn, roll the three dice and add attackers (0-2) to the six enemy routes (each dice has two symbols). If the enemy arrive on a space with a player, that player is dead – if they arrive in the capital, game over. Player turns see each player act, with the amount of actions determined by player number (always a total of 12, so 6 each in a two-player game). An ‘action’ is either move a space, kill one enemy or place an uprising token. That’s it – no dice, no player powers, no items. You’ll notice the board is in three colours: there are three ‘rebellion’ spaces around the edge of the board, each matching one of these colours. When you hit these spaces, any uprising tokens on towns of the same colour become a fortification – slowing the enemy. In certain strategic positions, these are super useful – but hard to pull off. The writer: I shouldn’t like Lembitu. It is structurally naive, the luck can be unmitigable and at times it feels like a prototype rather than a product. But what can I say? It’s fun. Chaos be damned – it’s so simple to set up and quick to play that if everything goes to hell you can set up and go again. And on the plus side, different player numbers makes for a very different game each time precisely because it hasn’t been balanced to within an inch of its life. The thinker: In one way I like the stripped, abstract nature of Lembitu: it has an elegance that is easy to appreciate. But those dice rolls are just too swingy, especially near the end when the enemy is getting two turns to your one. I need to feel good play will be rewarded more often than not and here I think too many games will be decided by the dice. But I wouldn’t turn down a game if others were keen. The trasher: I found this one to be fun, in a crazy dice fest kind of way. The game moves at a great pace and we actually played back-to-back games after getting thrashed the first time – which is quite rare for our group. That said the abstract nature means I probably wouldn’t miss it if we never played again: it just lacked a bit of personality, despite some fun pics on the board. If only those sea monsters were actually in the game! The dabbler: While I didn’t hate Lembitu, I was quickly shouted out of the picture by more alpha gamers. Beyond the colour of your plastic piece you have no personality, no power, no distinction – it’s even worse than Pandemic in that respect. I ended up being given a quiet bit of the board and just plugged away, doing what I was told. It was fun watching things unfold, but I didn’t really feel part of it and the theme was totally lost on me. Lembitu is definitely a game that will irk the pampered modern gamer. With no player powers or hidden information/traitors there is plenty of room for a gobby ‘alpha gamer’ to take control and order everyone around; while a player taking a risk could well be eliminated in the first round and have to sit the rest out. The latter isn’t much of an issue though, precisely because of the first point: no player powers. You don’t feel invested in your character, but you do feel invested in winning – in solving the puzzle. Moving a particular piece feels like an arbitrary part of proceedings. In addition the setup dice rolls (showing how far the enemy troops have encroached before play begins) can swing from practically non-existent to outside the city gates – and there is no official way to make a game ‘beginner’ or ‘hard’ difficulty. It’s down to luck. But again this just makes it feel like a different puzzle to solve each time. But from a design perspective there is a lack of cleverness or subtlety behind the scenes, which will annoy some: it has a microgame ethic, but not a microgame size or price point. But others will appreciated the stripped-back vibe that moves so far back away from the fiddlyness of games such as Dead of Winter and Robinson Crusoe. And a minor point: I would’ve liked a token to represent the ‘free move’ you get after moving on a road. The extra action makes sense, showing you made more progress by moving on an established route, but when you’re trying to work out your moves it can get a bit much when another slightly different action is thrown into the mix. Purists may well mock Lembitu for its naive, retro design – I know there are some players I wouldn’t put this in front of knowing the derision that would follow. But for me it is an absolute keeper. Friend and fellow game designer David Thompson described it perfectly as a ‘guilty pleasure’: a game that ignores recent conventions and suffers mechanically because of it, but has enough old skool charm to carry it off and be a success regardless. Bad luck can, and sometimes will, see you lose – while on other days you’ll quite easily coast to victory. If you can’t take that from a game, walk away now. But quite often the game sits on that tightrope edge between victory and defeat – where that risky move could give you the edge or lead you to certain doom. This is something I’ve heavily criticised in my review of Dead of Winter, so why do I find it OK here? Simple – this is a puzzle that sets up in two minutes and does not have me role-playing or investing in theme: you can set up and play a game of Lembitu in the time it takes to get Dead of Winter out of the box. * I would like to thank designer Aigar Alaveer for providing a copy of the game for review. The Institute for Magical Arts* is an area control card and dice game for two players from Biblios designer Steve Finn. While the box and title suggest a thematic game of magic it is very much abstract in how it plays: I wouldn’t let the theme either sway you toward it or put you off, depending on your outlook. Playing out in about 30 minutes the game comes with 60 cards, 70 wooden pieces and eight dice, along with instructions and a reference sheet – making it good value for around £20 (everything here is definitely of solid if unremarkable quality). This is very much a one-on-one game, with the winner being the player with the most points at the end of the round in which someone reaches 20 or more. There are take-that elements that can’t be ignored, with the heart of the game being an area control mechanism (much like that in Smash Up) where you compete to claim cards and then use their powers. Gamers looking for a reference should very much think of The Institute for Magical Arts in the same breath as small box games such as Jambo/Asante or Targi, rather than a less complex game such as Jaipur or Lost Cities – but if you like the cut-and-thrust of either it’s worth reading on. While The Institute for Magical Arts has some relatively complex mechanisms at play, the game is easy to teach due to all the information/components being open when you need to discuss them – or at any point someone would need to ask a question. Game-play very much revolves around the dice, or more accurately what you choose to do with them once they’re rolled each turn. Players have identical hands of six cards: two used to attain ‘power stones’ and four to assign them. Each turn starts with the players rolling their four dice simultaneously and assigning a card (face down) to each one – and yes, there are of course plenty of ways to mitigate the rolls. 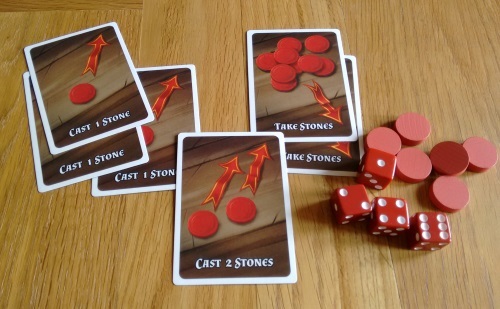 Both players then reveal and use their cards simultaneously, taking/assigning stones to cards (in spaces – you guessed it – one to six) in the centre of the table. Most are ‘institute cards’, each of which has two requirements that need to be met to be claimed: a minimum number of stones spent, plus a clear majority it needs to be won by. This means you may need to have laid at least three stones on the card, but also need to have laid two more there than your opponent – so if you lay three and your opponent two, the card (and stones) stay in play into the next round. In this way a card can have many more stones on it than required if it is hotly contested. Cards won are added to a players tableau and their points immediately scored (each has a value between 0 and 7). Cards also give their winner an ability – either a once-per-turn or one-off power, all of which bend the rules of the game in fairly standard fashion. There’s a little more going on than that, but hopefully this gives you an idea of the game’s relative simplicity in terms of rules. The writer: I like a good bluffing game and The Institute for Magical Arts has the elements it should need to be one. The secret dice assigning leads to a lot of second-guessing, while there are several routes to victory hidden within this very small package. But beneath the potential of bluffing the game is really about logic and once the game is settling down in the middle stages it can become quite predictable. A little chaos would’ve helped for me – but then the game feels as if it knows its audience and that should be seen as a strength. The thinker: Possibly the game’s greatest asset is the potential game of chicken that awaits you as you choose whether to re-roll your dice. As turns are simultaneous, one of you has to decide whether or not to re-roll or stick – leaving your opponent the chance to act afterwards. It’s a highly unusual game state and one I thoroughly approve if, adding to the game’s one-on-one appeal and intensity. Ignore the fantasy sheen – this is a thinker’s game with a small element of luck and a much bigger dose of decision making. The trasher: I really liked The Institute for Magical Arts – in theory. Trust me: you do not feel like you’re casting spells. With the exception of a few nasty ones, most of the card powers are incremental rather than game changing – and as everything is open you can see it all coming a mile off, so even the stronger ones lose their ability to add excitement. The ‘character’ cards sum it up: they have none, beyond unique art and a name – no powers, just a basic set collection score. The dabbler: Sadly I didn’t feel the personality here at all and the game-play was just ‘meh’. There’s very little effort made to pretend the theme isn’t just pasted on – they didn’t even stretch to individual art for all the cards, or any flavour text. I’m not really keen on two-player games at the best of times, unless they’re a bit more raucous. This is more about keeping your poker face on, but after a few turns I’d lost my smile anyway so no problem! It’s like Smash Up without the smash (or the up). There’s not much to work with in terms of opinion on The Institute for Magical Arts right now, but in terms of criticism the words seen most often are ‘boring’ and ‘unfun’ – things I think I’ve addressed above. But as I haven’t been 100% behind the game so far, I think it’s also worth looking at some of the more positive comments – and there are many. Fans describe it as ‘light’ or ‘super light’ (both to play and learn), blending interesting mechanisms to create a unique duelling/area control game. There’s nothing I can argue with there – except to say that this is very much a Steve ‘Dr’ Finn game. I was fascinated by my first game of Biblios, laboured a little through my second and am not interested in playing it again. This, for me, is a much more interesting game – and Finn fans seem to generally agree. But I still couldn’t get most of my gaming friends excited enough to want to play it more in future. The Institute for Magical Arts is a good game: it is well designed, simple to teach, and everything holds together under scrutiny. It has that enforced battling element you’d expect from a two-player-only game and plays varied and fast; cleverly mixing bluff, dice and area control. But is it fun? If you like thinky abstracts with just a dash of theme – or any of Finn’s other games – it is definitely worth checking out. Others may be advised to try Biblios (which is widely owned and available), as I think they have similar qualities in terms of theme and mechanics (Biblios is a card game where you are forced to ‘gift’ cards to your opponents as well as yourself, trying to amass cards in different currencies while also manipulating the value of those currencies). Personally, if I’d found anyone who enjoyed playing it with me that I thought I’d play often enough, I’d have kept it. As it is, I’ll be moving it on – and I’m sure there will be plenty of Dr Finn fans happy to snap it up. * I would like to thank Games Quest for providing a copy of the game for review. 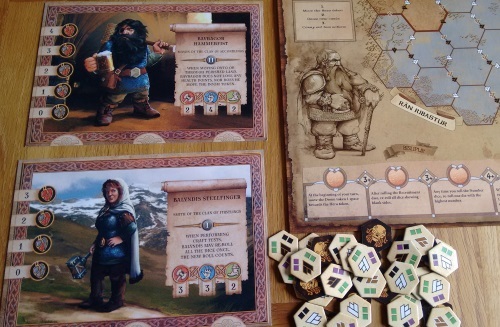 The Dwarves* is a fantasy themed co-operative board game which plays out in just over an hour. It is listed as two-to-five-player but also works very well solo and plays well across all player counts. The game-play is classic co-op, as you’ll find in titles such as Pandemic and Defenders of the Realm. It is very much suited for families as well as gamers who like thematic games. Each player has a character with individual abilities and decides what to do on their turn, but this is discussed as a group because you’re working towards a common goal. The tension mounts the longer the game goes on, and the group of players will either win or lose together – there are no individual victory conditions. In the box you’ll find a gorgeous game board, five player boards with matching cute plastic minis, 100-ish wooden cubes (the encroaching enemy horde), 10 dice, 50-ish cardboard tiles (mainly marking the enemy’s taken land) and 80 cards. (Those lucky enough to get the ‘special edition’ got more of just about everything, including monster meeples, but the ‘Saga Expansion’ looks to include the same ‘more of everything’ for the rest of us). First released in Germany in 2012 under the title Die Zwerge, it is set in the world of the books of the same name by author Markus Heitz. While huge in Germany the books have failed to have quite the same impact elsewhere, often blamed on what are seen by many as pretty poor translations. This lead to a reluctance on Pegasus Spiel’s part to release the game in English – hence their decision to crowd-fund the game via Kickstarter. It smashed its €30,000 goal (passing €118,000) and is now on general release. 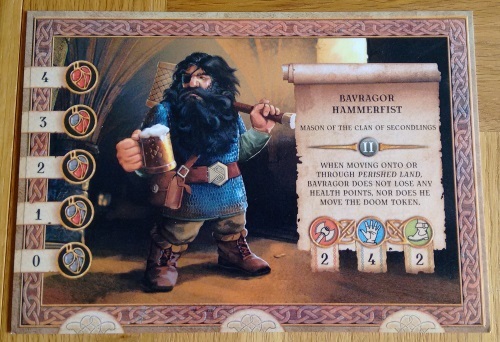 It is also worth noting the design team behind The Dwarves, Michael Palm and Lukas Zach, were the pair behind celebrated 2013 party game ‘Bang! The Dice Game’. NOTE: The version you see pictured below has a paste-up board and cards from the original German version. Expect big changes in the ‘proper’ version. One of the beauties of classic co-op games is that they’re very easy to teach and The Dwarves is no different. There is no hidden player information and you’re all on the same side, so in fact helping is beneficial to all! A player’s turn follows a simple structure: move the hero token (bad stuff), draw new cards (if any were completed on the last player’s turn), then carry out two actions – the turn structure is even printed on the main board. Moving the hero token will do one of three things: shuffle threat (read: bad) cards into the adventure (read: good) deck, roll dice and add bad guys to the board, or move the council marker in the wrong direction – all of which I’ll discuss below. The key to winning the game is completing a number of scenario cards before either one of the heroes (that’s you guys) is killed, or you run out of time (marked by the hero token track). Each scenario card has a condition that needs meeting before you can move onto the next and the harder you want the game to be, the more of them you include. 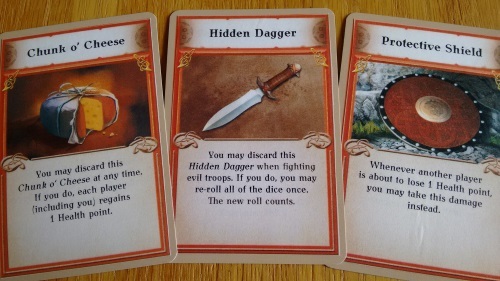 Alongside the scenario card will be three adventure cards. These are non-essential side quests but a handy way to gain items (in the form of cards) and other benefits. 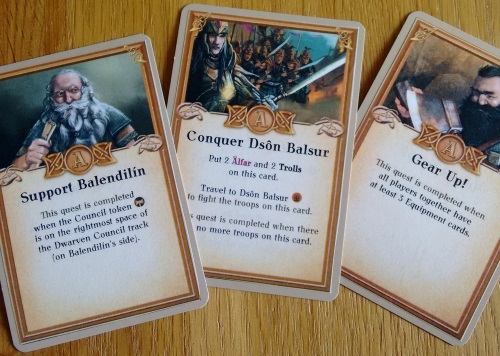 When you finish a scenario you also clear out the current adventure cards and replace them – but as the game goes on some will be threat cards (see ‘moving the hero token’ above). You’ll face dire consequences if you didn’t complete them, making for some tricky situations. 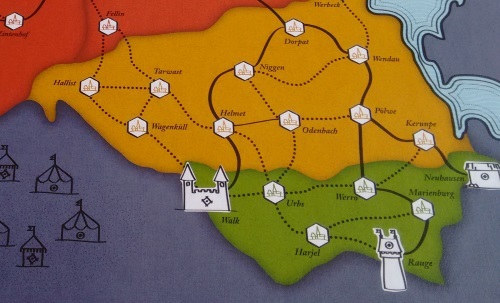 The hero token starts on the left side of the hero track, but there is also a doom token at the other end – and like Knizia’s Lord of the Rings, if the two meet the heroes lose the game. The doom token will rarely move early in the game, but f the enemy troops get some traction you may need to start worrying about it. Most hero track actions involve rolling the recruitment dice, which slowly bring enemy troops onto the board. They come in from four locations that all have paths leading to a central square (Blacksaddle). Once they start arriving here the doom token can start to move at an alarming rate – time to wrap up or face defeat! While this sounds like an old mechanism it is done well. When five enemy units occupy a hex they burst it, turning the land ‘perished’ (making it a pain to move through) before moving on. A tile is flipped and placed on the hex – its detail showing the main direction of troop movement and which headed to neighbouring tiles instead. Bad luck sees several tiles burst in a row while paths can also meet – speeding the enemy’s path to your door. Finally there’s the council track. It starts in a neutral position and can be moved right by the players (giving nice advantages), or left by the enemy (predictably giving penalties). Each hero has a health level, three stats (attack, crafting and speed) and a special ability. You get two actions on your turn, all revolving around stat-check dice rolls. While luck is of course a factor, it can be well mitigated. Tests see you rolling a dice for each number you have in a stat, so asking Boindil to complete a 5+ crafting test when he has 1 crafting is a desperate or stupid act – especially if it is Balyndis’ turn next and she gets 3 dice for crafting, plus a re-roll of them all. But it means things are never certain, which again adds tension. 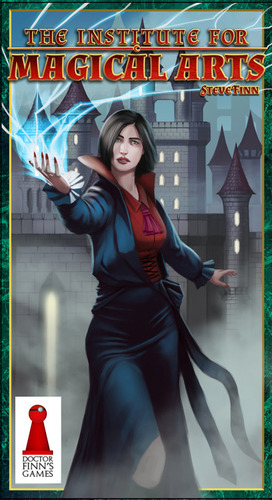 Your actions allow you to move, fight, influence the council or try to complete a scenario or adventure/threat card test. For movement you can move as many spaces as the best dice you roll; for the council, you need to get a certain number to move it one space (there are four each side of the neutral space) – needing a six to move into the best two slots. Fighting is also simple. There are three enemy types, the easiest (orcs) killed with a 4+, trolls a 5+ and elves a 6. Simply go to the space you want to fight in, roll your dice and deal damage accordingly. The risk is that if you manage no hits at all, you take a wound in damage. All cards – scenario or otherwise – revolve around these same actions. You may need to move from A to B, fight creatures on the card at a certain location, or go somewhere and craft some items. But importantly the theme is felt throughout. The final twist is in the last scenario card, which is actually three cards you turn one at a time until one equates to the current state of the board (how many enemy troops are on the board, or how many perished land tiles have been laid). This adds a nice element of surprise to the game’s finale. The writer: One thing that really impressed me were the ways you can change the difficulty level. Adding more scenario cards makes the game harder, but a little longer; while changing the number of enemies that bust a hex from five to four makes it harder and shorter. Doing both simply makes it insane, but it’s great to have more than one way to change things up. The thinker: The Dwarves sang for me as a solo experience. There is something to appeal to the table top miniatures fan here as the lava-like flow of the enemy movement combines with the dice rolling for attacks. And while it has quite a few components only the cards felt fiddly, but certainly not unmanageably so. But for me there is not enough decision making to make it more than a solo game. The trasher: At the right difficulty level, The Dwarves really ramps up the tension. You can choose your own character, letting me grab one of the warriors and get right into the think of it. Battles are fun if simple and by the end you can be rolling seven attack dice if you play your cards right – with a re-roll! But then you’re relying on the crafters to do their thing too, making it a great co-op. The dabbler: As always I was worried about the alpha gamer problem, but it hasn’t really cropped up in our games – but this may be the group, not the game. Whatever happens it will be you rolling the dice though, so no one can stop you doing what you want to do! The theme is great too, while the dice mean you’ve all got something to cheer – or as often commiserate over. Great with the right group. There aren’t many English reviews or comments on the game yet, but those I’ve seen raise some valid points. The biggest are the game lacks decisions while the amount of randomness makes it too much of a luckfest. Yes, there is a lot of random – which is why I wouldn’t (and didn’t) recommend The Dwarves for groups of more advanced euro gamers. But this shouldn’t worry those who enjoy lighter games, or a dice fest; and especially those with an interest in the fantasy genre. And personally, as a euro gamer myself, I really enjoy it solo. I think the lack of decisions is covered by the same argument: those getting into the theme or playing with less experienced gamers will play their own game can get a real kick out of it – especially fans of the books. But this is generic fantasy 101, which isn’t going to sway those who are looking for high culture. One frustrating random situation can occur early on: you get the ‘Gear Up’ scenario card (have three items equipped) and then get a run of adventure cards that don’t reward you with items. But even this can be overcome by raising the council track to the limit (very advantageous anyway) then crafting your own items. One fair beef with The Dwarves may be on replayability. Despite having three end game scenarios I can see the game getting samey if you played it to death, but after five plays I’m still enjoying myself – especially having now found a challenging game level. I could name many games that failed to get to five plays in our house. Finally you can find you don’t need to pick up equipment or fight monsters, as you simply work through the scenario cards and do what they tell you. If you’re in this situation, you have the difficulty level wrong: ramp it up and watch the sparks fly. This is probably my longest review, but as this game hasn’t had many English write-ups yet – and because I’ve really enjoyed it – I thought it was worth the extra time. While it isn’t the biggest or cleverest game out there, from a design perspective I love the way the enemy moves on the board; while as a simple soul I love rolling dice and crushing orcs: The Dwarves has become my favourite co-op and is a keeper for me. There are definitely players I won’t be putting this in front of and a lot of people who won’t like it. But when the snobby elves head home, this will regularly be hitting my table. * I would like to thank Pegasus Spiel for providing a copy of the game for review. It was an early paste-up version of the base game using some components from the German version, so please be aware there will be significant changes in the final release. Adventure Tours* is a ‘take-that’ and hand management card game from Seiji Kanai (Love Letter, Brave Rats/R) that is both a little larger and a little longer (40+ minutes) than his rather more illustrious micro games. It takes three to six players. It was originally released in 2010 under the title Mai-Star in a small box format with a geisha theme, which didn’t sit well with some. While still available in this format, Adventure Tours addresses some problems with the original and has higher production values – while costing about the same (£10-15). The original had 75 cards, six geisha cards and some score sheets to write on; while the re-released Adventure Tours boasts thick cardboard player mats with some lovely artwork, more than 100 cards (with good if unexceptional art, but good iconography), cardboard victory point chits and some useful player aids – but a much bigger box. As you may have guessed though, the theme is wholly irrelevant in terms of the rules – this is an abstract card game with some nice, colourful art plastered on top. And this is cutesy artwork too – which very much belies the rather nasty nature of the gameplay. As we’ve come to expect from Seiji Kanai, Adventure Tours is a simple game at its heart which relies much on player interaction to make it sing. It is also very luck based and swingy, but enough so that things should balance out over the game. Each player is dealt six random cards (from one big shared stack) at the start of play. In the basic game, your player board starts you with three of each of the game’s three ‘resources’ to get you going. On your turn you will lay one card – either for its resources or as an explorer (for its action and also end-game points). If you lay a card for resources it will allow you to play more powerful explorers later, as cards cost between 1-9 resources to play. Cards played as resources mean you have to pick up a new card from the stack to replace it, so you’re not reducing your hand – but you are giving yourself more chances to lay better explorers later. When you lay an explorer, you do not draw a new card. Explorer actions are very much what you’d expect from a ‘take-that’ style game: make player players draw more cards (to stop them going out), or force opponents to discard/hand you explorers or resources. But some also benefit you more simply – letting you lay another card being the most common. The advanced game sees you use the flip-side of the player boards, each of which has a special ability and different starting conditions – so that powers that seem stronger leave you starting with hardly any resources. 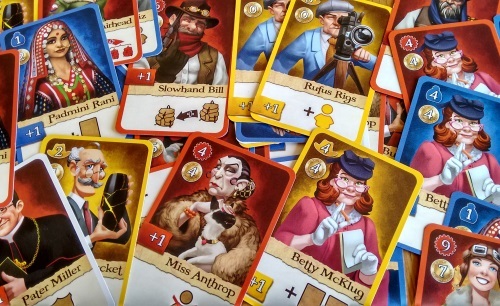 The real trick to Adventure Tours is to balance getting rid of your cards while also scoring enough points to make ending the round by doing so a good idea, or to just stockpile points regardless – neither of which are as easy as they sound! The nice player aid and simple icons mean everyone should be up to speed within round one. The writer: This is a rare time when I’m still on the fence despite multiple plays. I enjoy the mood Kanai’s games create and he has worked the same simple magic here – but this is on the cusp of being too long for the game experience it creates. I do enjoy playing, but where the luck of the draw makes me laugh in Love Letter it can have me cursing here, which suggests a slight mismatch in fun and complexity. The thinker: There is really very little for the strategist in Adventure Tours. Games instead become about bashing the ‘supposed’ leader – which is more about those with good chat talking the meeker participants into thinking a particular player is winning. The only real strategy seems to be: don’t be leading after round two, then try to have a big third round very quietly. Not for me. The trasher: I like this one! It’s all about table talk and hitting the right players at the right times, which is much like spinning plates. Both ways to lay cards make you a potential target, but for different reasons – going out or scoring big. You have to be a hawk, pointing out anyone who is edging an advantage – except yourself of course! And yes, I’m echoing the strategist – but from the complete other side of the table. The dabbler: While aggressive games aren’t usually my thing, this one is so nice, bright and colourful that I just got swept along with it. Also the take-that cards never devastate – more hinder – so nothing you can do will put someone out of a round, for example. There is room for clever combos and lots of table talk and laughter, so for me what’s not to like once you get past the fear of being a bit snidey! If we ignore complaints by people who were never going to like it in the first place, the most common issues with Adventure Tours are that it’s repetitive and that it drags, even for some who enjoy the game. But simply shortening the game from three down to two rounds (or even one) will solve this – I don’t see how you really lose anything, and it brings the game much more firmly into the ‘filler’ category that the mechanisms suggest it belongs in anyway. A bigger and related issue is that too many cards make the game last longer. Giving people more cards, for example, rarely feels ‘fun’. It feels like a necessity, while there’s no guarantee it’s even giving you an advantage – you could be handing them the perfect card. But again, this is something that wouldn’t feel like an issue if the game played shorter. And without wishing to sound like a broken record, for a game lasting close to an hour if played ‘properly’ (ie, three rounds) there are too few options in turns of card options. Essentially they boil down to pick up cards; add extra or take away cards; defend; have an extra go, or get bonus points. You see these cards a lot – probably too much – but over a round or two instead of three I think this is mitigated. My final concern is the advanced player powers: it’s too early to say for sure, but some of them seem really overpowered. now in the right group this isn’t a problem, as players will realise this and pick on the players with the best powers accordingly – it can actually add to the fun of the table talk. But in less boisterous groups it may be an issue. And a quick word on the original, Mai-Star. While I haven’t played it I have seen the cards – particularly the advanced player cards – and there have definitely been adjustments made for balance. Have they worked? No idea! But they’ve certainly tried to address well publicised issues with the original and I certainly didn’t think anything in Adventure tours was ‘game breaking’. My fear is they balanced the game by making it longer. Adventure Tours isn’t a game I feel I can wholly endorse, but at the same time wit the right group I’ve had a lot of fun with it. ‘Take-that filler game’ is already a niche, so when you put it in a big box (despite nice production) and make it last more than 30 minutes you’re going to scare some people off. But underneath is a typically simple and fun Kanai game – 12 different cards that interact with each other in interesting ways and get the table laughing and chatting. If you’ve enjoyed his previous titles this is certainly worth a look – although I’d give it the ‘try before you buy’ (where possible) caveat just in case for the reasons discussed above. * I would like to thank Coiledspring Games for providing a copy of the game for review. Sushi Go! * is a light-n-fast card drafting and set collection card game originally released in 2013 and reprinted in its current form (in a swanky little tin) in 2015 from Gamewright. Designed by Phil Walker-Harding it accommodates two to five players easily, takes less than 30 minutes, plays as young as six to eight-years-old and should cost you less than £10. While the theme has no relevance to game play the cards (there are 108 of them) are super cute and high quality (linen finish), while the tin is nice if you like that sort of thing (I’m a box man myself!). The rulebook is colourful, nicely laid out and simple to follow. If you took out the cringe-worthy ‘jokes’ (which I can only hope are for the younger audience) and extraneous art they’d probably fill a single side of A4 – including several variants (one of which is great for two players). As for teaching, it couldn’t be much simpler: deal everyone the appropriate amount of cards (dependent on player count), choose one each simultaneously, reveal and place into your tableau, then pass the remaining cards to your left. The only wrinkle is the ‘chopsticks’ card, which allows you to play two cards in your turn instead of one if you pass on the chopsticks card, but otherwise it’s rinse and repeat until you run out of cards. Once all cards have been laid, you add up the scores. Scoring is again simple, with several standard set collection scoring methods applied across the different sets of cards. The exception are ‘pudding’ cards which are, of course, only scored at the end of your meal – which is three rounds long. No surprises, at the end the highest score wins. The writer: While I think there’s a lot of design space still to be explored within the drafting mechanic, Sushi Go! is the perfect ‘bare bones’ usage of the mechanism: clean, fast and simple. 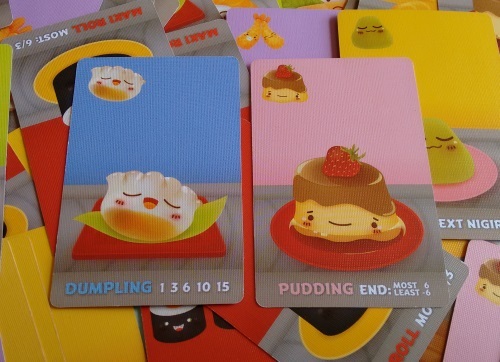 It’s a shame about the end-game pudding scoring, as it’s the only thing stopping you finishing when it suits you; the perfect fillers can be put down at the drop of a hat when that extra player arrives, or another game finishes. The thinker: While the chopsticks do add a bit of thought to the game, this is just too simple for me to really enjoy. I’m not averse to a filler game, but I’d prefer them to either test my brain or be super silly and light – for me, this game falls between those into a murky middle ground. I can see younger gamers enjoying it, but it won’t be a keeper for my groups. The trasher: I enjoyed the push your luck elements here – especially with the ‘wasabi’ card which allows you to triple the score of a ‘nigiri’ card if you place one on top of it – potentially nine points, or potentially none if everyone else denies you the good ones, as wasabi is worth nothing on its own. Despite the cutesy images, this can be a nasty little take-that game in terms of denying scoring opportunities. The dabbler: I love the Sushi Go! art, love the simplicity, love love love it! The two-player game doesn’t get much love, but the variant is pretty cool. You have a dummy third hand, which you take it in turns to draw a bonus card from. This throws in much more luck, but can add some really great moments when you take a risk and the perfect card drops into your hand from the third pile. Great fun! 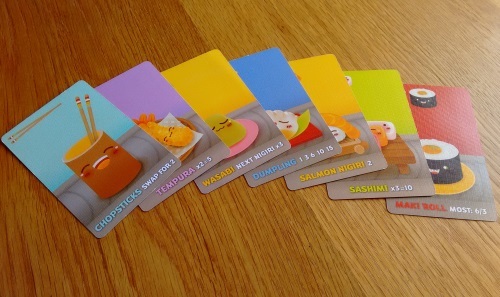 For such a simple card game, it is impressive to see Sushi Go! sitting in the top 500 games at Board Game Geek. Filler games, fairly or unfairly, average lower scores there so for such a light game to get an average above 7 is impressive. But like every game, it still has its detractors. As this is a card drafting game, there are the inevitable comparisons to 7 Wonders. Sushi Go is often described as 7 Wonders without the depth, or 7 Wonders lite – but on the other hand, many say it ‘fixes’ 7 Wonders by taking out the pretend complexity and shortening the game considerably. To those who say it lacks depth, may I remind you – its a filler! And to those who say it just copies 7 Wonders, may I remind you that if anything it copies Fairy Tale (from 2004) – a game it is much closer to in play style and which 7 Wonders (from 2010) also largely copied, simply adding a layer of ‘engine’ on top of a perfectly good game. If you think Sushi Go is a little too light for your tastes, Fairy Tale is definitely worth a shot. As an exercise in distilling the idea of card drafting into a simple set collection game, Sushi Go! ticks all the boxes. Whether that’s the game for you is of course a very different question, but there really isn’t anything to hate here if you know what you’re getting into. Personally it has reminded me of how much I enjoyed my plays of Fairy Tale, which really is a game I should add to my collection (its more of the same, but with an extra layer of complexity). But until I get around to picking it up, Sushi Go! will be hanging around on my shelves. If you’re looking for a light family game and have kids in the six to 12 age group, I’d definitely recommend it.